But I’m a bit surprised Scrooge survived this story, and not because of the architect. Louie should have looked up "dollar-hydrogen mix" in the Woodchuck’s Guidebook before trying to poison Scrooge with a mix of dollars and carbon trioxide. Looking at the chemical formula he obviously got the wrong tank! I’m not sure what the original text say, but I have this story in a German "Lustiges Taschenbuch". There he is given proper treatment with gold dioxide according to the formula. Probably the same mix as in "Up Against the Wall" where he gets "gold oxygen" (translated from the Norwegian print). But never mind all that. What I’m going to talk about in this blogpost is Grandpa Beagle …or wait, did IDW just call him Blackheart Beagle in "The Bigger Operator"? That’s the only story Barks drew with Grandpa Beagle, at least looking like that and called "grandpa". We do see him in "Dime and Dime Again", a story based on a plot by Carl Barks. But the plot that can be read in Uncle Scrooge Adventures #42 does not mention Grandpa Beagle specifically, so he was probably added to the story by Geoffrey Blum. In "The Fantastic River Race" we get to see a character called Blackheart Beagle in a memory from Scrooges youth. There’s no information in the story that directly tells us that this is the grandfather of today’s Beagle Boys. But if we assume Scrooge is about the same age as the "brawling sons", and use the fact that the steam boats engineer is Gyro’s grandfather; yes, Blackheart Beagle might be Grandpa Beagle, or at least one of the Beagle Boys’ grandfathers. In "The Master Of The Mississippi", Don Rosa tell the story about how Blackheart Beagle got to own the riverboat seen in "The Fantastic River Race". We also get to know why they started wearing masks and at the end we even see Blackheart Beagle use the term "Beagle Boys". In "The Invader Of Fort Duckburg" we see Blackheart Beagle making a reference to what happened in "The Master Of The Mississippi", so we know for sure that this is the same character. But his appearance has changed. Now he has grown a beard and started wearing the prison clothes with the same number as seen in the Barks story with Grandpa Beagle. But he kept his captain hat. Jumping further into the future, in "The Richest Duck in the World" Blackheart Beagle have grown older looking even more like Barks’ Grandpa Beagle. He is also introducing his grandsons. 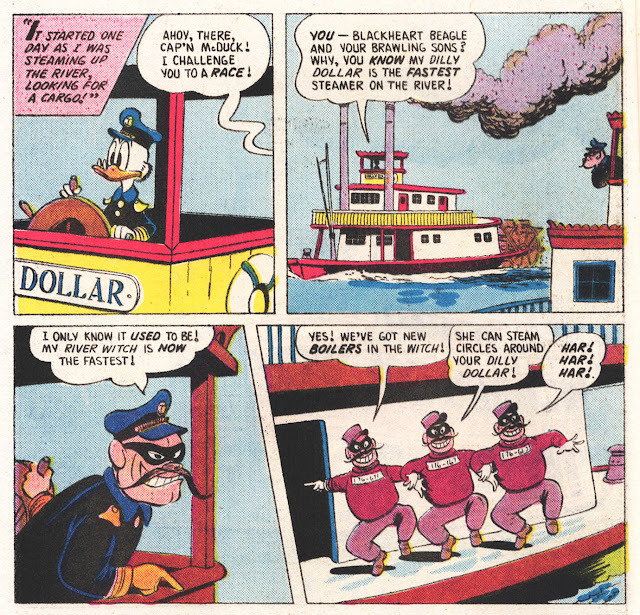 We see him again in "A Little Something Special"
If anyone still don’t get the riverboat captain Blackheart Beagle and Grandpa Beagle connection, Don Rosa got it all explained one last time in "The Beagle Boys vs. The Money Bin". Here we can see all three generations of Beagles at the same time. During Western’s run of Disney comics we can see other artists using the grandpa with different looks, both with a mustache and with full beard. But they are never called by a name other than "grandpa", "gramps" etc. In Brazilian stories, the grandpa usually has the chin strip and mustache look as the Strobl-story above. Grandpa Beagle is used in a ton of Italian stories, thus in several variants too. But the most common look is with a beard and a smoke pipe. 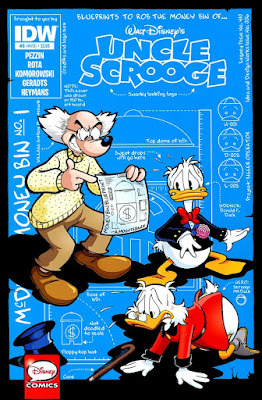 Before IDW’s Uncle Scrooge #6 I think we have seen only one single American print with the Italian grandpa. You can find that story in Gemstone's Donald Duck Adventure #19. Other than the Don Rosa stories, there are not that many Egmont stories with Grandpa Beagle. But the ones that exist use a character that looks kind of a mix between the original Barks grandpa and the Italian one. To summarize; we’ve seen a lot of different looking grandpas. And looking at the examples in this blogpost they also have different number tags. But most of them are just called "grandpa". The only times we have seen a character named Blackheart Beagle is in one Carl Barks story and in all Don Rosa stories. But all Rosa stories have some kind of reference telling that this grandpa really is the riverboat captain. Any other random grandpas have never been named, at least not in any English translations. So when IDW does this in "The Bigger Operator", that’s a first as far as I know. 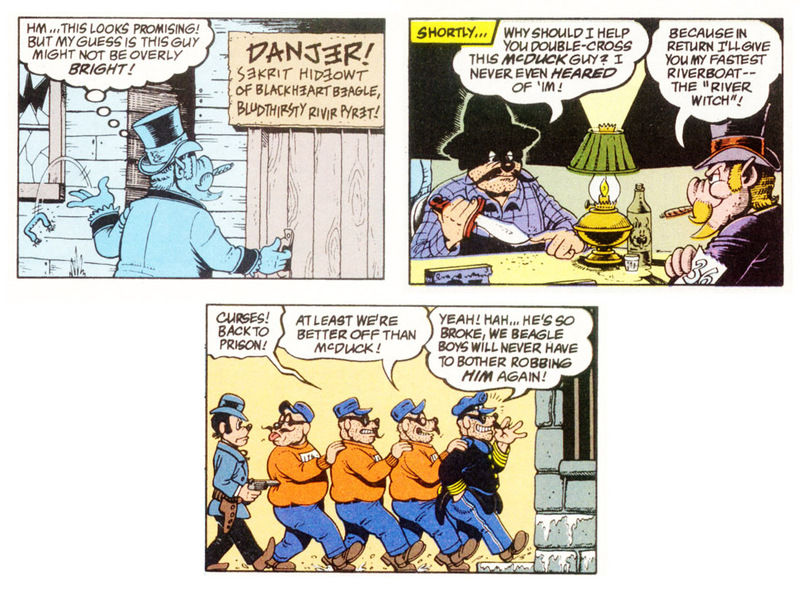 It was noted in a comment that Don Rosa had an earlier mention of Blackheart Beagle in Cash Flow, where the Beagle Boys tell us they are his grandsons. When checking up on "Dime and Dime Again" for this blog, I overlooked the fact that Grandpa Beagle actually is called Blackheart at the end of that story too. Uncle Scrooge first calls him Sherman, but that is a reference to earlier in the story where he pretended to be Sherman, the jewellers brother-in-law. So that’s not his real name, it’s just the rest of the Beagle Boys being stupid. It seems IDW is not the only publisher that is starting using the name Blackheart Beagle for the Italian-looking Grandpa Beagle. In Nonna Papera e Nonno Bassotto la strana coppia, a story printed in the Italian Topolino (the same week as IDW printed "The Bigger Operator"), he tells Grandma Duck his name. Translated: "Bah! A long time ago I was also known as Captain Blackheart Beagle, but now everyone calls me grandpa." The above comment was about the "Mickey's birthday in the daily newspaper strips" post. So I moved it there. You did a very good analysis of the Grandpa Beagle character! However, I think you should add that although "The Life and Times of Scrooge McDuck" is the first story to specifically say that Blackheart Beagle and Grandpa Beagle are the same person, Rosa already implied this in "Cash Flow" (1987, story code AR 106). In fact, in that story a Beagle Boy says: "I'm just glad Blackheart Beagle can't see his grandsons stooping to stealing apples!". I don't have a copy of the original version of "The Bigger Operator", but I'm pretty sure that Blackheart Beagle is called "Nonno Bassotto" ("Grandpa Beagle") and that he has a sign reading "GRAZIA" ("pardon") instead of the number 186-802, as it usually is in Italian stories. Not that I mind the change: it seems to be commonly accepted now that Blackheart is Grandpa (though INDUCKS still treat them as separate characters), and having its original number 186-802 is more logical than having "grandpa" or "pardon". By the way, since you have the original version of "Dime And Dime Again", could you post the upper half of the last page? I ask it because I have only read the story in its Italian translation. Interesting! Thanks for the information. I completely overlooked the Blackheart name in "Dime And Dime Again". I did a small update at the end of the blogpost based on your comments. I'm glad I was able to help. I am also surprised that you could find a good scan of that recent Italian comic so quickly. I live in Italy, but I haven't bough Topolino in years and thus wouldn't have known of that story hadn't been for that bad quality scan on facebook. I think it's safe to say that it's one of those articles that inspired the name used in the recent Italian story, as it is "Capitan Bassotto Cuornero" and not just "Capitan Bassotto". The Italian edition of "Dime And Dime Again", on the other hand, translates "Blackheart" with "Cuorenero", which is the same as "Cuornero". I guess it would have been weird to translate that line as the equivalent of "You told us you were named Captain!" Anyway, if I were doing an Italian to English translation of "Capitan Bassotto Cuornero" I would just write "Blackheart Beagle" and drop the "captain", though of course it's not wrong to keep it. As for the "I was also known": "also" is the correct translation of "anche", but in this case it doesn't refer to the fact that he is known with two names. Instead, it it a reply to the fact that he called her "Grandma Duck", and she said her name is Elvira. Grandma being called Elvira or even Elvira Coot is not uncommon in Italian stories, as there are many examples, following Rosa's "Life and Times" and family tree. Since IDW is printing many Italian comics, and since most Italian stories with the Beagle Boys feature Grandpa Beagle, I guess we will soon have a third appearance of "Italian Grandpa Beagle" in an American print. When that happens, I hope you update this page, as I'm curious to see if this third appearance will follow the translation of the first story or the one of the second story, in regard to the character name and prison number. As always I end up talking too much, so I'll shut up now. This is of course unrelated of the fact that Blackeart Beage and Grandpa Beagle are the same person, but maybe it could interest you. 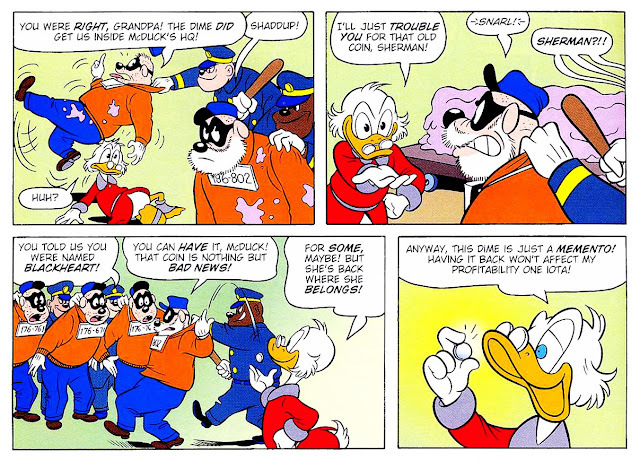 In IDW's Uncle Scrooge #8 (412) they use "Grandpa Blackheart" for the Italian-looking grandpa again. So it seems they are trying to establish that as his regular name. Interesting. The story is a 1-page gag from 2011 written by Roberto Gagnor and drawn by Giada Perissinotto (story code: I TL 2922-01). 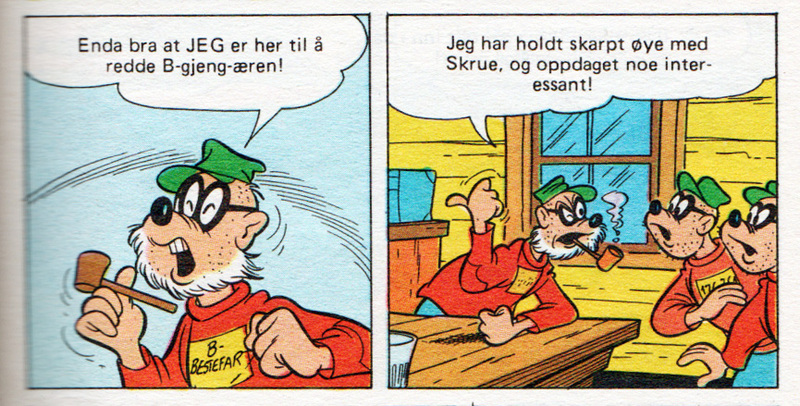 The pictures on Inducks are small, but I can see that in the original version a Beagle Boy simply says "nonno" (meaning "grandpa"), while in the English version it has became "grandpa Blackheart". Also, the prison number is mostly covered by a book in both versions, but I think once again "Grazia" has been replaced with the number 186-802. I also noticed that his pipe has been erased: I wonder if it was done to make him more similar to the Barks/Rosa version of the character, or if it is just censorship. If it is censorship, it is a weird one, since his pipe was not removed in "The Bigger Operator". Indeed, it seems they have estabilished Blackheart as his regular name and 186-802 as his number. Will you update this page with this new use of the name (and number)? I hope so, and I also hope you will report if there are any more uses of the character in the next months. By the way, how many times is the name Blackheart used in "The Bigger Operator"? Another thing: Grandpa Beagle (called this way rather than Blackheart) also appears in the 2015 videogame "The Duckforce Rises"; his beard is a bit longer than in the comics, his prison number is 186-802, and he seems to be smoking a thin cigar or a cigarette in a holder. However, his avatar for "Enemy Turn" shows a shorter beard and a pipe. By the way, I am still wondering how you could find good quality scans of "Nonna Papera e Nonno Bassotto la strana coppia" so quickly. Are you Italian? Or are you in contact with Italian readers of Disney comics? 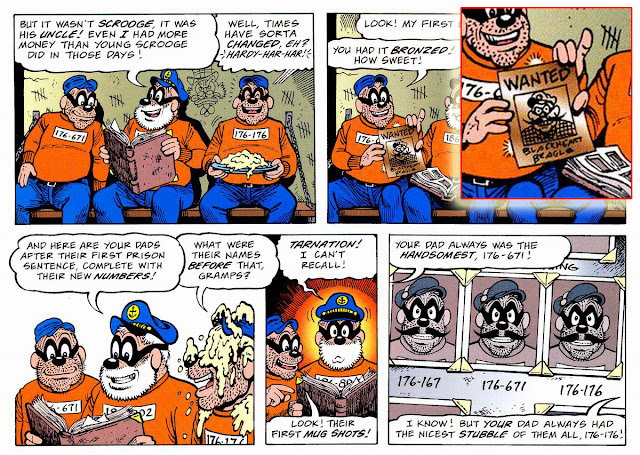 I planned on making a new blog about WDC #725 and US #412 that came out last week, and do a note about the new Beagle Boys one-pager there. But I haven't got the time yet. So we'll se if I do that or maybe update this post. That game looks interesting! I didn't even know it existed. About the image from "Nonna Papera e Nonno Bassotto la strana coppia". It's actually not a scan but a screenshot from the digital edition of Topolino. So I got it fast :) I don't collect new Italian comics, but yes I know a few that do. The games seems to be based more on the comics rather than the DuckTales version of the characters, which is great. Digital edition? It makes sense. "The great Blackheart Beagle! Look at his eyes!" "They didn't exist back then!" "Well.. er... he is scary!" "He is cruel, ruthless, he doesn't fear anyone! What would he tell you?" "That we are behaving... bad?" Beside Grandma Beagle looking differently, this Blackheart Beagle doesn't look like Blackheart at all! Maybe it’s because the writers and the artist are different people, and maybe Cavazzano wasn't aware of the estabilished look of both characters. 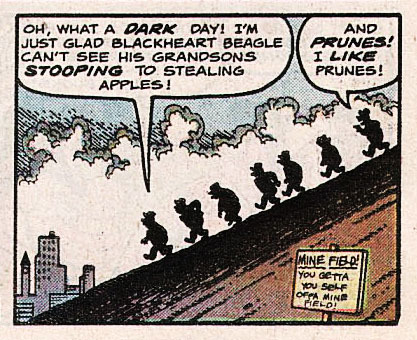 Another strange thing is that Grandma seems to talk about the founder as he were dead or as if the Beagle Boys didn't know him. Maybe the two writers of this story regard Blackheart Beagle and Grandpa Beagle as two different characters? Or maybe the writers consider them to be the same character who is dead in the present? It could be, since stories with Grandpa don't feature Grandma and viceversa, so they may take place in different continuities; indeed, I seem to recall a story where it is implied that Grandma Beagle is a widower. Or maybe Blackheart is intended to be Grandpa and is intended to be alive, and the "What would he tell you?" thing is just a reference to the fact that he is not with them at the moment. I wish I could see the dialogue in the original version, as Italy was the last of the few countries that published this story, and the writers are not Italians. is a guide to the Beagle Boys' travel trailer (they live in a travel trailer in Italian stories), published in Topolino #3067 (September 9, 2014). "Ritratto del Nonno Cuorenero" means "Portrait of Grandpa Blackheart". 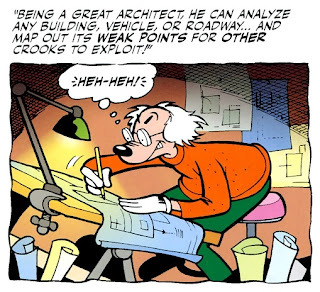 The fact that he is referred as "Grandpa" seems to imply that the people who did this guide agree with Don Rosa's idea that Blackheart is Grandpa, but if this is true then why does he have a captain uniform AND a white beard, while according to Don Rosa he stopped wearing that uniform way before his beard become white? And why is he suddently called "Grandpa Blackheart" while he has been (and still is) called "Grandpa Beagle" for decades in Italian stories? Maybe we are supposed to believe that it is a recent picture of Grandpa wearing the uniform for nostalgic reasons, but I think we can see moustaches (not as big as Barks and Rosa would draw then, though), so it seems it is a photo from the past. The writers of the guide are Barbara Garufi and Blasco Pisapia, and the latter did the art. Maybe Pisapia had a small role as a writer, and the answer to my questions (including: why is the captain uniform different?) could be that this is just another case of the writer being different from the artist. Maybe. As I guessed, 186-802 replaced "GRAZIA", but I was wrong in thinking "Blackheart Beagle" replaced "Nonno Bassotto"; in fact, the policeman simpli says "I Bassotti?!? ", which means "The Beagle Boys?!?". I have not read the whole story, so maybe he is called "Nonno Bassotto" in some panel. I got the Norwegian edition of I/D 2010-009. In that translation the photo on the wall is not even of the grandpa, but the great-great-grandpa (not named). So the name Blackheart Begle was a (bad) addition of Italian translators? Well, the writers are Americans working for foreign publishers, but since the Norwegian version makes more sense than the Italian version, I guess the Norwegian version is more faithful in this case. Is this great-great-grandpa still referred as the founder? 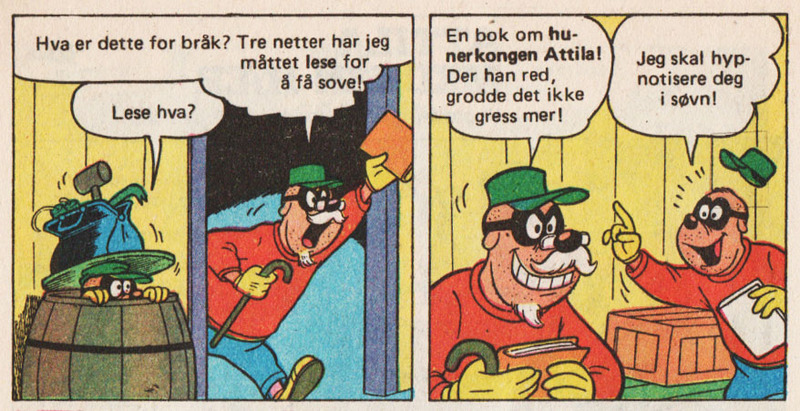 Anyway, since you have access to some Norwegian issues, do you have the original 1994 version of chapter 12 of "The Life and Times of Scrooge McDuck"? I am curious to see what does page 5 of the 16-page version look like. Oh, I almost forgot: what do you mean with "when Don Rosa’s collected works were published in Europe, all stories underwent a color revision with input from Don Rosa"? Are you referring to any European version, or does "collecte works" refer to the book tat reprint all of his stories? 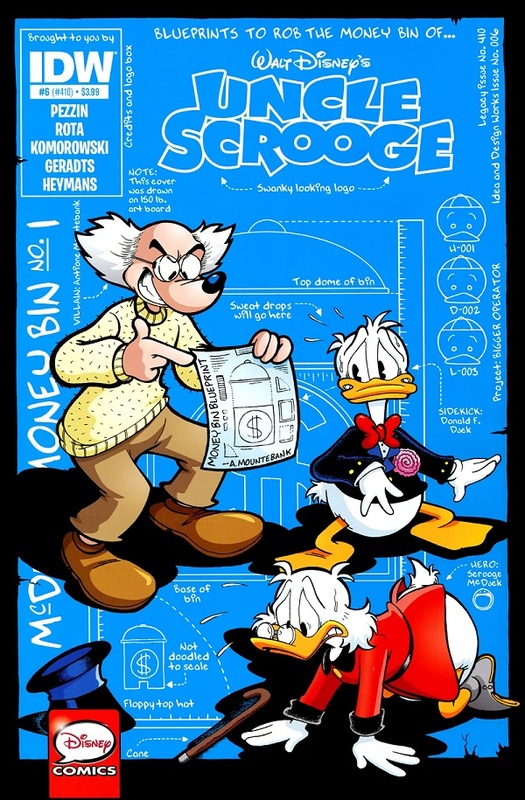 I guess it's the latter, since many European version of Don Rosa stories have messd up with the coloring, Still, even if that image comes from one of those books of Rosa-only reprints, I find it hard to believe that he meant Blackheart's sweater to be blue and thus colored differently from the sweaters of his grandsons. I'm talking about this collection. The same books (only in different language) were printed in Finland, Sweden, Germany and Denmark too. "I'm talking about this collection": thanks for clarifying it. Does the introduction of the collection say that Don Rosa himself gave colouring instuctions for every single story? If so, I would find it strange. I know that Barks had no imput on the colours in "The Money Well" (or any other story), but still in every American version of it Grandpa Beagle's sweater is drawn white (when the other Beagles are white) or orange (when the other Beagles are orange, which is the most common colour for them in American publications), so I don't see why would Don have a Grandpa Beagle with a sweater coloured differently compared to his grandsons. I think it look better when they all wear a sweater of the same colour, but maybe it's just me. ll scan the 5th page of chapter 12 later": great, thank you for that. I have an idea of how the other pages look like, but page 5 is the most difficoult one to reconstruct. New art have been inserted several places throughout the story in the 19-page version. But the only piece of art that's acutally removed from the 16-page version (and redrawn) is the panel were Donald and Scrooge are shaking hands. Google translate make some really weird text on the page I'm going to link to now. But about the coloring of the books I talked about, this page say "Don Rosa himself has made specific requests that have been addressed in coloration.". If that include the blue shirts I don't know. and I correctly guessed that the last strip of page 5 (original) was the same as the third strip of page 6 (extended), but it would have been impossible for me to reconstruct the third strip with those three panels without knowing how much the same panels have been expanded in the 19-page verson. Now I think I know how the 16-page version is as if the whole story were right in front of me. Thanks again for the scan. there was a long discussion about colours, and Don Rasa said "From the first, I suggested to Egmont that the sweet and pretty sister, Matilda, should obviously have angelic BLONDE hair... and the hot-tempered feisty sister, Hortense, should obviously be the brunette. But they seldom paid attention to my coloring suggestions. In this case, though young $crooge's hair was colored wrong in American comics, his sisters' hair was colored as I wished. (Maybe it was only a coincidence.)" If those books ignored Don's suggestions for the colours of Scrooge's sisters' hair, maybe they also ignored other things, though I don't know if this applies to Blackheart's blue shirt as well. As far as I'm concerned, and same goes for David Gerstein, Grandpa Beagle and Blackheart Beagle ARE the same character. I'd have been tickled if my translation was the first to call him Blackheart outside of Rosa, but I knew it was too good to be true. Thanks for catching that gas tank - but how do ya know that isn't just a lazy bunch of formulas and that the combination of $a and CO3 does create dollar hydrogen out of thin air? We're cartoonists, not scientists. I hate to play the anti-fun nerd here, but $aCO3 means to be a carbonate salt, and salts can't exist as the form of gas. Of course AuO2 also doesn't make sense, because it violates the rules, and metal oxides are solid. $aO2 would be better. The writer for the last panel is clearly building on Don Rosa's works since Grandma Duck introduces herself as Elvira, a name invented by Rosa (this was one detail that he didn't get from Barks). Also in case someone doesn't speak any of the above languages, Italian Grandpa's tag says "Paroled" instead of a number. It's true that Don Rosa didn't get from Barks the name Elvira for Grandma Duck, but at the same time he didn't invent it either: the name appeared (as "Elviry", an obvious nickname for Elvira) in W WDC 121-04 (?/Riley Thomson, October 1950). The surname Coot, on the other hand, was decided by Rosa as part of his idea of making Cornelius Coot her grandfather. Starting in the 1990's, the name Elvira Coot has often been used in Italian stories whenever the situation required Grandma's name to be stated. "I will also point out that in the Italian edition of "The Fantastic River Race" Blackheart Beagle is called "Capitan Bassotto" ("Captain Beagle"), which is a bad translation but isn't surprising considering that it was the 1950's and bad translations were the norm"
It's true that in the modern Italian translation (2008's La grande dinastia dei paperi #18, which may be the same version as 1994's Zio Paperone #59) Blackheart Beagle is called Capitan Bassotto ("Captain Beagle"), but in the first edition (1958's Topolino #192) he was called Capitan Bassotto Cuor-Nero (Captain Blackheart Beagle).